Sure you can plonk an interestingly shaped weeping conifer in the centre of a garden bed or off on its own in the middle of the lawn and call it a day. There’s no doubt your specimen plant will be an eye-catcher. But there’s so much more these surprisingly versatile trees can do. 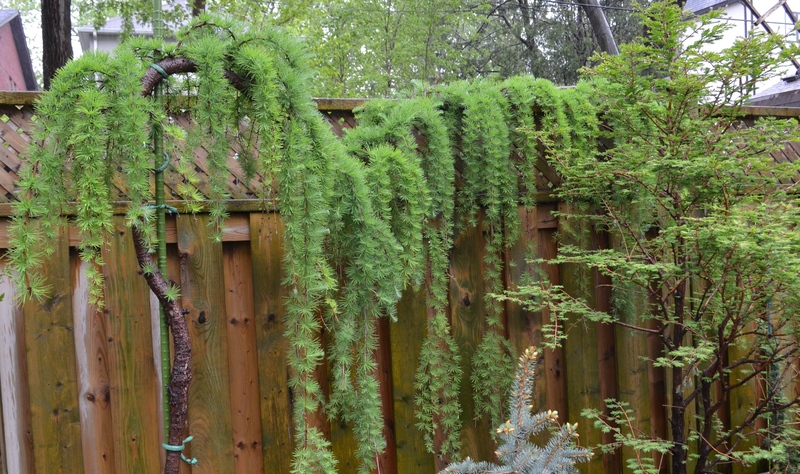 Here are five ideas for making the most of a weeping conifer, even for small gardens. Weeping Japanese larches (Larix kaempferi ‘Pendula’), like this one shown below, take well to being pruned and trained. This larch has been trained along the top of a privacy fence. The result is magical. For small garden owners, this is a great solution when you want unusual texture but you don’t have a wide garden bed to accommodate shrubs. The Weeping European Larch (Larix decidua ‘Pendula’) seen in the centre of this photo adds lovely vertical interest without taking up a lot of space. Lime green in spring, the needles turn gold in autumn. Its delicate shape really comes into play in winter when the bare branches are thrown into stark silhouette. Take advantage of this by positioning a deciduous larch where it’s sure to have a clean backdrop so you can see its lovely shape clearly. I’m not exactly sure of the names of these lovely dwarf trees marching around a circular garden at Whistling Gardens, near Hamilton in southwestern Ontario, but I wouldn’t be surprised if they’re weeping Norway spruce (Picea abies ‘Pendula’). To get this effect, you’d have to plant a lot of these gorgeous conifers which is, admittedly, not within most budgets. Planting just three of these beauties in a row, however, could be all you need to create a spectacular partition or backdrop to a garden bed. 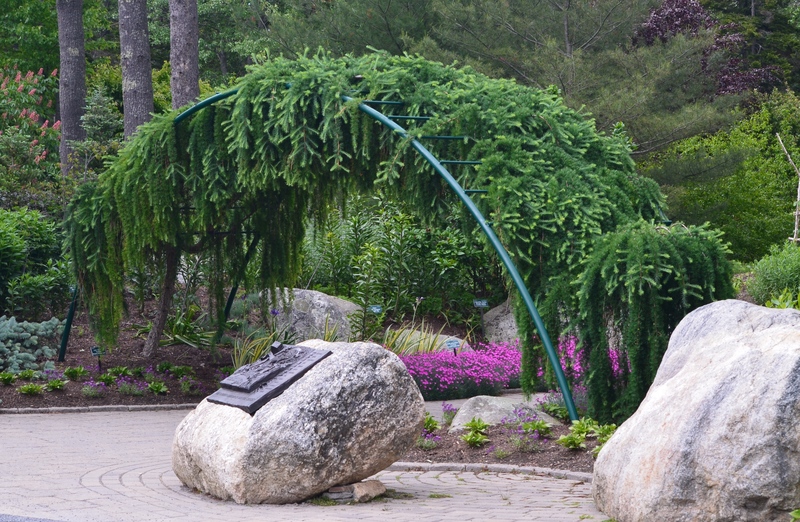 This archway at the entrance to the Coastal Maine Botanical Gardens is a spectacular way to mark a pathway. As you pass underneath it, you can’t help but reach up to run your fingers through the surprisingly soft branches. 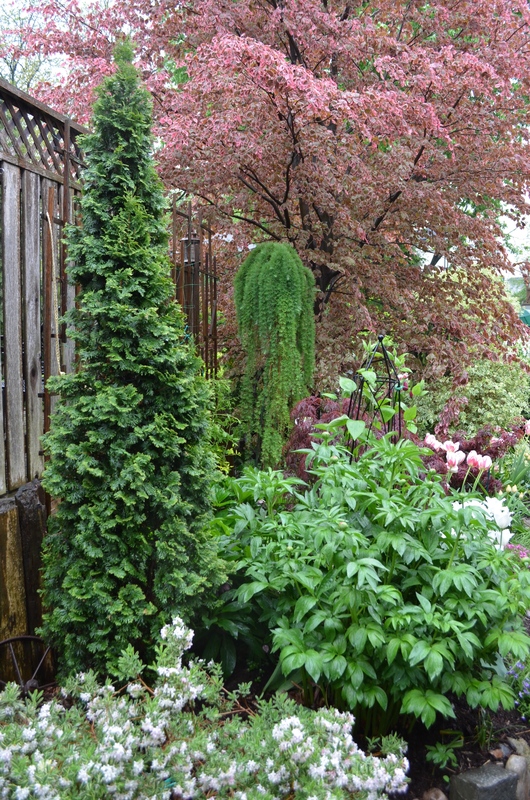 For those of you who have already seen this photo in my post Rocking The Countryside, I apologize but I had to include it in this post because I just love how these two very different weeping conifers have been positioned. 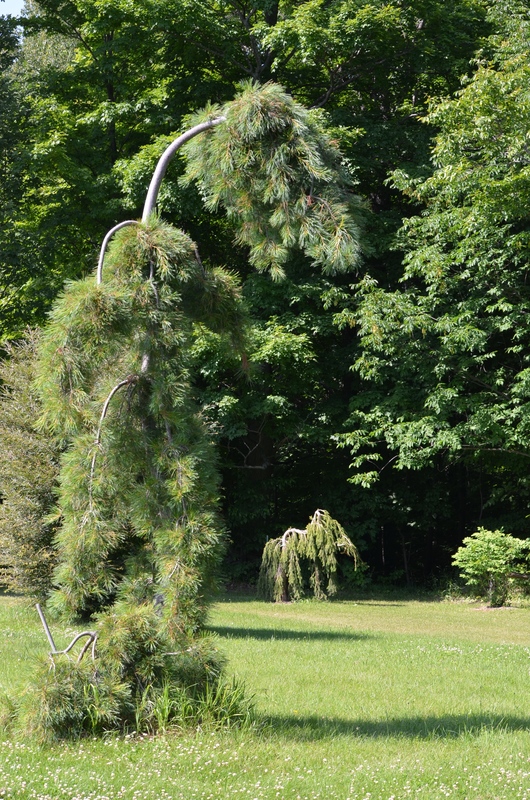 Both trees have clearly been planted as specimens, standing out, as intended, from across the very large lawn of this garden in southwestern Ontario. The relatively consistent, finely textured backdrop of deciduous trees works beautifully to highlight the large weeping conifer in the foreground, with its long, bluish needles in clumps along a trunk with smooth bark. And, in the distance, the smaller weeping conifer (looking for all the world like a baby elephant to me) just dazzles in the sunshine with the shade of the forest behind it. The gardeners used what was already in their garden–the edge of a natural wood–to impressive effect. All this to say: If you’re thinking of planting just one or two weeping conifers, give the positioning some thought. Turning the placement of your tree from OK to Amazing can just be a matter of finding a terrific backdrop such as a dark fence or the shadowed wall of your neighbour’s home in the distance. ← Do we need robot weeders? I always find so much inspiration in your posts – too many for my small garden, but a girl can dream! Thank you. Thank you! I always find much food for thought in your posts.